It's been a busy few weeks around here. I just finished my senior thesis and this Saturday is FOODSTOCK - Wesleyan's food writing conference - which I'm helping organize! But many of you have asked about my food-themed senior thesis, and I want to share. I'm a major in The College of Letters at Wesleyan, it's an interdisciplinary humanities program. One of its great perks is that you can write your senior thesis on just about anything. Which is why I wrote mine about football! A version of my table of contents; Italian nonnas from NYC. I wrote mine about food. Italian food to be exact. Italian-American food in New York City, to be more exact. It traces the development of Italian food in NYC from when Italian immigrants began arriving in the late nineteenth century, through the adoption of Italian food by American home cooks in the early twentieth century, and ending with a look at the rise of the Italian restaurant industry in NYC. It asks: Why did Italian food become America's first and favorite ethnic food? It looks at everything from the development of Little Italies in NYC to the rise of the prepared and canned foods industry to Italian speakeasies, the mafia, and pizza. Yep, I got to write my senior thesis about pizza. While many immigrant communities have brought their cuisines to America, the Italian story is one of particular importance. This is so not only because it has become one of America’s most beloved cuisines, but because it is one which has remained loyal to its roots in Italian culture while becoming a uniquely Americanstory. As any Italian immigrant to this country can tell you with unwavering conviction, the Italian-American experience of food has never lost sight of its past on the Italian peninsula. But when Italian food came to this country, it established itself in an American way, one that pays homage to American ideals of life, family and culture. It has found such success as a cuisine of “home cooking” because in fact home cooking has always been a piece of American culture, even as today it loses ground to food prepared outside the home. Italian cuisine’s entry into American cultural life both for the Italian immigrant and others presents a story of family, food and, often, good fortune. Why did I choose to write my thesis on this, you ask? Well, it had a lot to do with my love of food and food writing, my love in Italian food in particular, and my fascination with New York City. As long as I could write my thesis about whatever I wanted, I chose to bring together a variety of my interests. My true food interest, though, is home cooking. 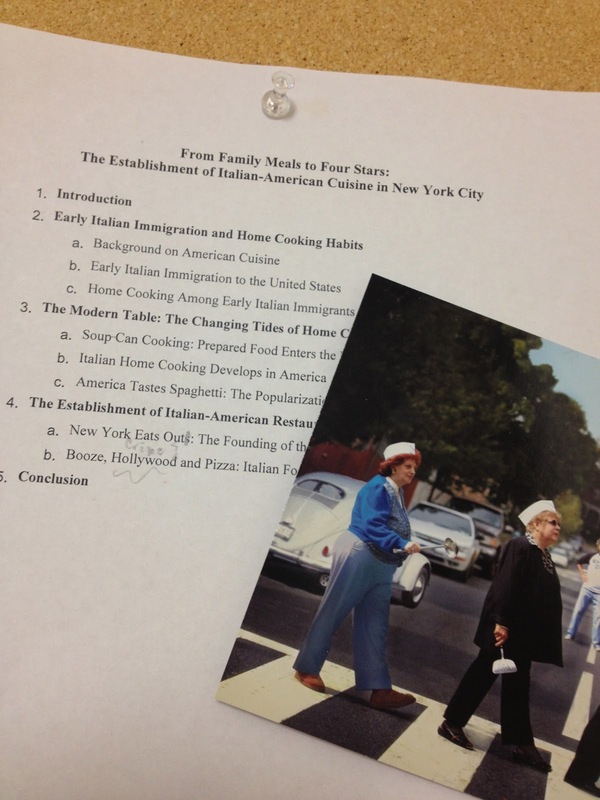 And really this thesis is about looking at home cooking through Italian food in NYC. Our dinner table at Wesleyan set for spring! Pasta with tomato sauce at a train station in Rome. P.S. A full version of the thesis will be online soon via Wesleyan's WesScholar. P.P.S. If you're attending FOODSTOCK this weekend I'll be speaking about my thesis on a panel discussion from 1:00-2:00pm. I can't wait to read it! Fascinating opportunity. Is grad school next, or did you do the thesis for you? Not sure about grad school - but I certainly want to continue writing about it! Look for an upcoming magazine series I will be writing based on my thesis as well! I am a professional content writer now, and sometimes I think of my college days when I was too stressed about maintaining my academic achievements, so I requested a professional writer to write me an essay, to avoid making mistakes.